When Robert Plant sang about the woman who bought her stairway to heaven he might not have realized that the stairway was actually built on the twelve strings of Jimmy Page’s guitar. He probably did, because the guitar is what makes that song iconic. It is just funnier to imagine Mr. Plant turning around in the middle of a live with astonished eyes, realizing the miracle that was being created. Which brings me to the point – the 12 string guitar is one of the most unique sounding instruments in the modern musical world. Despite its basis being the average guitar, the instrument is hard to make right and the beautiful sound is lost in mediocre guitars. Which is why, for all the aspiring Jimmy Pages I have created a list, of the best 12 string guitars available. Simply buying the top available guitar is not the only thing required to start playing the 12 string guitar right though. The additional 6 strings bring a challenge that neither a 7 nor an 8 string guitar demand, though to some the 12 string are easier than 7 or 8. The make of the instrument demands a period of adaptation only after which you will be ready to play all 12 strings the way they are to be played. Though, before you start learning, you need to pick up the actual best axe you can get your hands on. The first instrument on the list is worth of you stopping and staring at it for a little while. 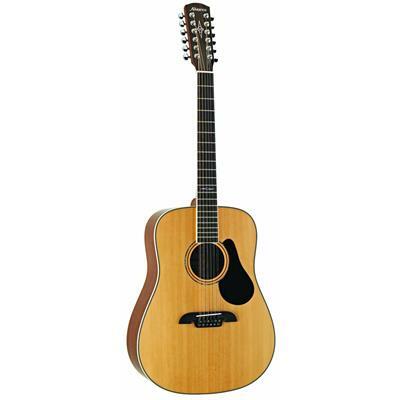 It is an example of outstanding guitar design, taken from the classical Martin D28 and upgraded into a 12 string Martin D12-28. The looks of the guitar are understated but handsome, but why would you need any more flash, when you have the tonality of 12 strings to blow the minds of listeners with? No guitar should be more interested in its looks more than in its sound and the beautiful 12 string Martin knows that. 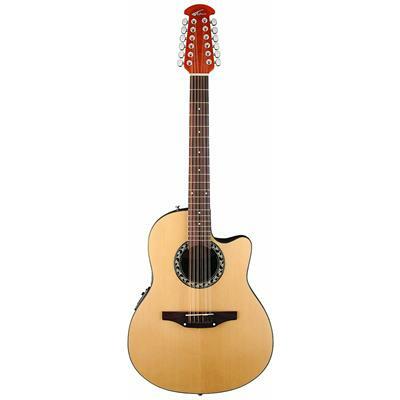 With its understated, classical looks it promises, and delivers, on exceptional sound and playability. As expected of a guitar in the high end market. A combination of East Indian rosewood and a Sitka spruce top body, the guitar resonates the notes in a sublime assault on the pleasure neurons of both the player and the listener. Do yourself a favor and give this guitar a chance. To those of our readers whose pockets do not readily open to the high end spectrum of the guitars I would like to say: I am in the same boat as you, but don’t worry, we’re not about to be sinking in the 12 string river. Taylor, the eternally considerate and amazing guitar engineer, offers a mid-rang alternative of comparable quality. The Taylor 150e is just as handsome, understated, unimaginatively named and sonically profound as anything your hands are itching to buy on this market. The Sitka wood spruce high tones are balanced by the deep tone reverberating Walnut body wood, resulting in the rich sound of the 12 strings being even richer. This guitar dons no cutaways, instead opting for the full power of the dreadnought to bellow your tunes into the world. Every note played on this guitar has the potential to wrench the heart of the listener into happy submission. A lovely instrument indeed. What Martin and Taylor do not wish to admit Takamine embraces: it is possible to make a good 12 string guitar and ask less than 500 for it. This incredibly affordable option for the likes of me, picky dudes with shallow pockets who like to find the best sound for a reasonable price. Don’t judge me, I got rent to pay. 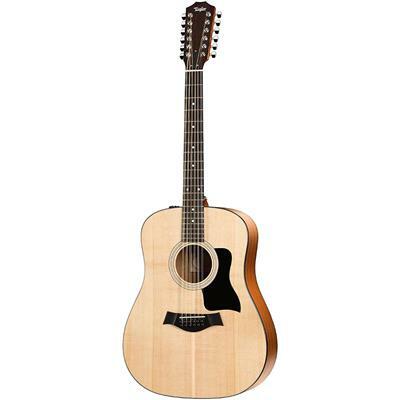 Takamine GD30CE features a booming dreadnought body made of mahogany topped with some beautifully resonant spruce. The special, split saddle design of the guitar allows the lowest and highest notes resonance that you would struggle to find in guitars of this price range. The added bonus of the instrument is the fact that it is actually an acoustic-electric guitar. 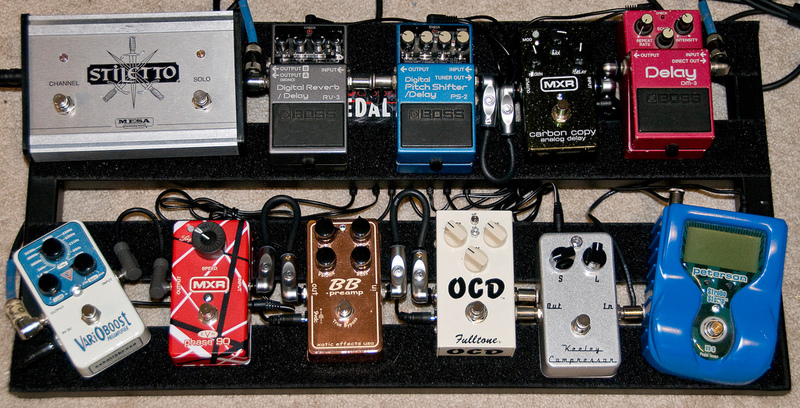 This means that no matter where you go, whether you have a mic or amp or neither, you will have a solid sound. Somewhere on the Atlantic coastline sits the Canadian village LaPatrie. In this town live several Quebecoise who spend their days making guitars. The hands of these men or women have crafted the Seagull Coastline S12 Cedar QI guitar, with the pure love and hard work that only a northerner is capable of. This guitar is precise and vibrant, delivering a well balanced sound that you would struggle not to fall in love with. The the dreadnought body is modified to be less explosive in its tone, resulting in a guitar that produces soft and calm tones with ease, but does not shy away from the deep tones and loud exclamations thanks to its laminated cherry body and spruce top. This guitar is an example of beautiful crafting, so much so, you might feel like taking a picture and carrying it around in your wallet. Tim Armstrong was a wise man, he knew that his Hellcat acoustic was an incredibly popular guitar. He knew it was the result of great sound and an affordable price. He also knew there was a demand for 12 string guitars. So instead of trying to invent a whole new guitar he took the Hellcat, modified it, and slapped all 12 strings on it. 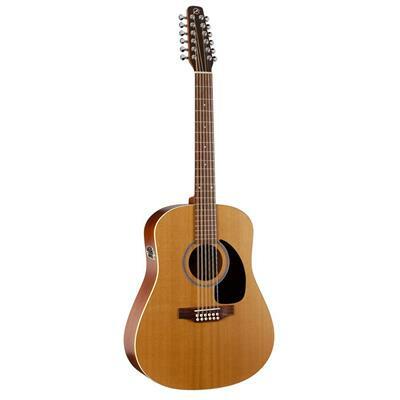 The result is one of the best value 12 string guitars that you can find on the market. The body is made of Laminated Mahogany, including the top. This means the deep tones and the high tones on Fender Tim Armstrong Hellcat are well balanced. You could see this when playing the instrument, with the very first arpeggio struck being a dazzling array of tones that assault you like a pleasant, warm, non-lethal tsunami. The lower you travel down the list the more affordable these guitars get. Yes, the more affordable they are, the less likely they are to sound like the guitars at the top of the list. This does not mean they are bad guitars, it simply means these guitars are the best of their class. 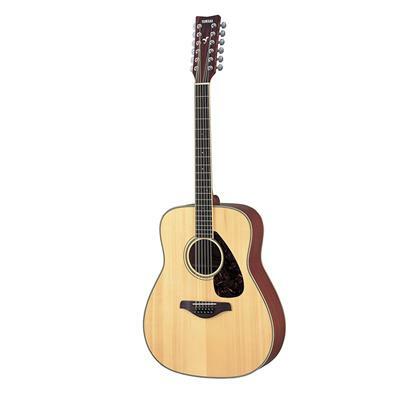 Alvarez Artist Series AD60-12 is a testament to that. This guitar stands out in its ability to hypnotize with its sound. The guitar’s song is a perfectly balanced ratio of resonance between the high ends, low ends and the mid-range of the tones. This guitar is the best affordable 12 string you could get your hands on, simply because it allows you to sound like a professional even when your wallet is as limited as mine. There are manufacturers in this world that like to advertise their products beyond reasonable expectations. They attach legends and stories to their guitars, build up your expectations and give them amazing names. Yamaha doesn’t do that, because it doesn’t need to. The world has come to expect quality out of Yamaha, and they always deliver. The FG7205-12 Solid Top is the perfect example of that. Not much is expected of this affordable instrument, but it smashes those expectations into the stratosphere. The sound and make of this guitar is exceptional, a well rounded set of tones and sounds that many would struggle to not place among the, at least, mid range guitars. This guitar is a great option both for a beginner and one looking to expand his or her array of skills into the unique. I highly recommend this guitar for its sound and ability to woo without anyone ever questioning the guitars viability. Don’t blame guitar manufacturers for the unimaginative names these guitars have. Not all of them are able to produce something that would make you stop and wonder, why is the guitar named the way it is. 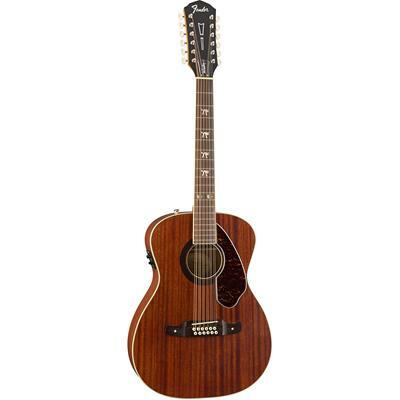 The Ovation AB2412-3-KIT-1 Applause Balladeer is one of the rare exceptions. The name implies what I try to point out in this article – the 12 string player belongs as part of the medieval, or fantasy, bard lore. This guitar understands that any aspiring musician looking to play the 12 string might not be able to afford everything that comes with getting one. This is why the guitar comes with a kit of items that you might find useful. This guitar is the jack of all trades among 12 strings, being an acoustic-electric, well rounded but affordable option for the bard unsure where he will be playing next. Epiphone likes making guitars and we like guitars made by Epiphone. Which is why this guitar is on this list. You see, when you make something with love, it shows. 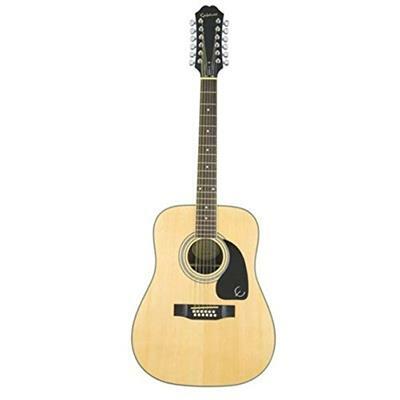 The Epiphone DR-212 Dreadnought is designed with the fact that the 12 strings put an extreme amount of pressure on the frame and the sound of the guitar. Which is why the guitar is built specifically in a manner that, instead of being hindered by this fact, uses it to the advantage of the sound. The result is a vibrant, stand out tone fitting to all the the needs of a 12 string guitar player, be they country, blues or an outlandish prog-rock buildup. Whatever it is, the Epiphone DR-212 is a classic 12 string guitar, the well rounded sonic masterpiece of affordability and quality. What was it that the cheesy ads say to attract your attention? Value, Value, Value! Yep, that’s it. Thing is, I am not saying this about Oscar Schmidt OD312CEB because I want to make fun of it. I am just unsure how else to express the amount of value you get out of this budget 12 string guitar. Anything but screaming at the fact that you can receive a quality, 12 string vibrancy for a price as low as this would be impossible. The making of affordable guitars is an art and Oscar Schmidt might have won the contest with this model. It is jam packed full of warm mid tones, impressive low tones and vibrant high tones. 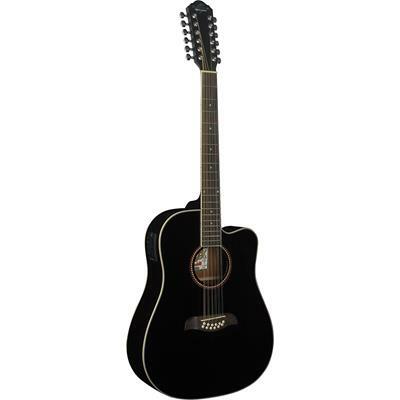 It is an incredibly comfortable entry level 12 string guitar for those looking to start their practice and learn, hoping to graduate to a bigger sound later. 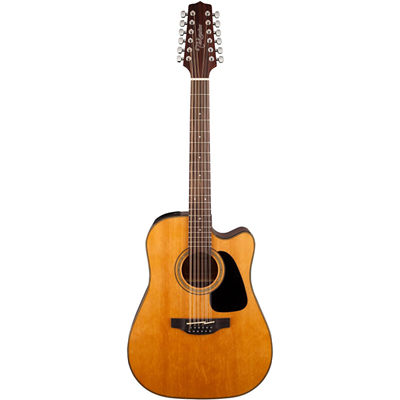 It carries a professional sound that will help you achieve the heights you seek with the 12 string instrument. Whenever I look at the 12 string guitar I am reminded of the Lute, the favored instrument of the wandering musicians romanticized in the modern world. The lute had 15 or 24 strings, depending on the period it was made in. It had a beautiful sound but was hard to play. Despite a step down in the number of strings, the 12 string guitar might sometimes feel like a whole new instrument too. It definitely sounds like a unique instrument. Historically the 12 string has been used in many contexts and genres, but it has been especially popular with hard rock. Their most famous use, as mentioned before, was the Stairway to heaven by the Led Zeppelin. The bardish instrument has also been used by a number of others though, including Jimi Hendrix, the Red Hot Chili Peppers, Leo Kottke, etc to a great effect. Their use of this type of guitar has resulted in beautiful, unique compositions, especially with Leo Kottke, who I highly recommend listening to. 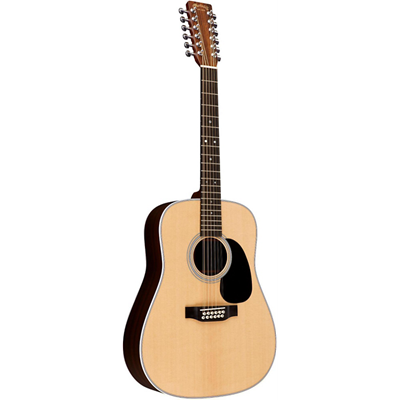 The 12 string guitar might also be a great addition to your repertoire of sounds. The 12 String guitar is more complex in make, as is to be expected, because of the additional strings. The neck, fretboard and body all have to be reinforced to support the additional pressure coming from the strings. This makes the guitar slightly heavier than an average 6 string, but also stronger and sturdier. The 12 strings are strung in “pairs”. Meaning that 2 strings are closer to each other in distance than to others, creating 6 pairs of strings. This allows these two strings to be played almost at the same time, producing a unique sound. The strings in pairs are usually tuned with an octave difference, other than the two upper courses, which, being tuned in unison, double down on the deep bass sound of the guitar. This results in a sound that is both beautiful and incredibly unique, allowing for creative use of sounds in the guitar. Be it strumming or fingerpicking, each tone played on the 12 string sounds much more vibrant and complex. Of course there are electric versions of the 12 string guitar, but the acoustic versions sound full and much more harmonically resonant. On the other hand the double neck guitar is better rendered in the electric version thanks to the lack of need to rely on a resonance chamber. … but still much harder than the 6 string. The 12 string is, as expected, harder to play. It requires more force when strumming or striking the strings as well as more pressure applied to the frets because of the increased tension in the strings. Additionally there is much less distance between the strings in a 12 string guitar when compared to a conventional string guitar, while the fretboard is much wider. This results in fingerpicking techniques requiring much more precision to be done well. The pick needs to be controlled much more precisely for the correct sound as well. Strumming techniques require much less precision, but the fret hand might still need adjusting if it is to put pressure on the correct frets. It is still possible to learn to fingerpick the 12 string guitar incredibly well, as demonstrated by many musicians, Leo Kottke being one of the greatest examples of this. Taking the time to master the instrument will, in the end, result in the mastery of an incredibly complex, rich sound that is going to be an asset to any genre. It is no good to be intimidated by any instrument, but a healthy amount of skepticism when deciding to learn the 12 string guitar is demanded. The guitar requires advanced techniques and skills to be played effectively and impressively. It takes effort to emulate Jimmy Page or Leo Kottke and you might feel like you do not have what it takes to be like them. That is not a good thing. I did not mean to sound discouraging because there is no such thing as an instrument that cannot be mastered. I simply want you to understand realistically the level of effort it would take to learn to effectively play the 12 string. It is not much different from learning to play the 6 string guitar or the 7 string guitar or the 8 string guitar. It simply takes commitment and effort that is eventually rewarded with an unreal sound. So if you have learned to play the 6 string guitar do not be afraid to challenge yourself and pick up the 12 string. Especially since the best 12 string guitars make it easier to play them than you would expect. It is my expectation that you might feel frustrated some day when practicing your 12 string. That is to be expected and is as much a part of learning to play an instrument as the end result is. Which is why I want you to remember – it will take much less time for you to be good at playing the guitar than it took you to be a mediocre player on a 6 string. Simply because the techniques of playing a normal guitar translate very well into playing a 12 string. So go ahead and embark this journey of expanding skill. The list of the best 12 string guitars is here to help you get there as fast as possible.